Success in the commercial aviation business is measured on quick turns and accurate fuelings every time. 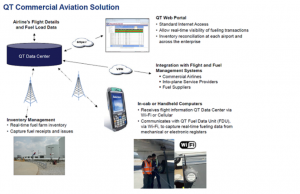 QT’s patented fueling automation solutions have been supporting rapid refueling for in aviation for over 25 years. And with the price of jet fuel on the rise, you have more incentive to ensure that every drop is accounted for correctly and quickly.